The moment you enter Elsewhere you will feel welcome and relaxed. The large open plan living area is notable for its majestic cathedral ceilings and huge picture windows. 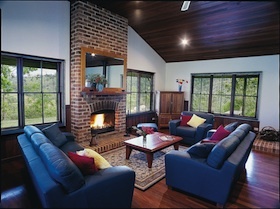 Warmed by a welcoming open fireplace and a slow burning combustion fire, it is furnished with comfy leather sofas and armchairs, entertainment unit housing video/DVD player, satellite TV, stereo system and iPod jack and 42 inch flat screen TV. The dining table sits 8 comfortably. 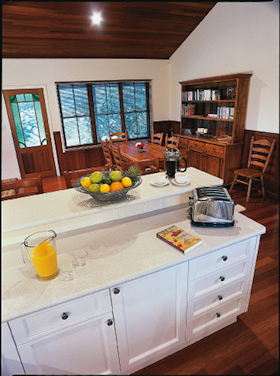 The kitchen is fully equipped with modern European stainless steel appliances including stove top, double oven and microwave as well as a large fridge and dishwasher. For added indulgence there is an espresso coffee machine. Also provided are quality matching crockery, cutlery and plenty of glassware (tumblers, wine and champagne) as well as copper based pots and pans, roasting pans, platters and all utensils required for cooking up a feast. There is even a selection of recipe books and condiments to help you prepare a gourmet delight. If alfresco dining is more to your taste, there is a 7 burner BBQ with back burner, side burner, roasting hood and spare gas cylinders and a ten person outdoor setting from which you can enjoy your meal under the shade of the market umbrella during the day or after sunset gaze at the amazing night sky. When it’s time to collapse there are four bedrooms from which to choose. Three have Queen beds and one has the flexibility of either two king single beds or one King bed. 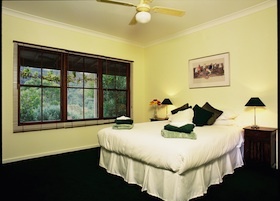 All beds are made with electric blankets, crisp, white linen and woollen duvets to keep you cosy. All bedrooms have bedside tables, reading lights, built-in robes, full length mirrors, oil heaters and ceiling fans. The master bedroom also has a digital alarm clock radio and bedside phone. A cot and high chair are available for infants. The house has two bathrooms. The main bathroom has a separate bath and shower, toilet vanity and overhead heating. The second bathroom is a 2-way en-suite with shower, toilet vanity and overhead heating. Hair dryers are provided in both bathrooms as well as soap, bath gel, moisturiser and toilet paper. There is a separate laundry with washing machine, tub, dryer, iron and ironing board as well as a sheltered clothesline.